Michael Gosney's January 2005 trip to Auroville is for research relevant to GCI's Green Community Network of communities and sustainability solutions. He is also going to explore to collaborations between Auroville and GCI’s proposed Califia project, a model eco-city and new community of 10000 to be built in the San Francisco Bay Area. A new presentation of the Califia conceptual model is planned to be a part of the Green Cities Solutions Exhibit that GCI is developing in conjunction with the UN World Environment Day June 1-5 in San Francisco. 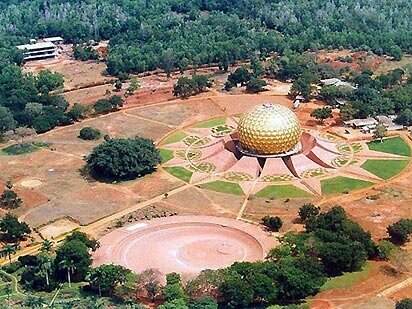 Gosney will also be exploring possibilities for Auroville’s potential participation in the exhibit, which will be seen by the mayors from the 100 largest cities in the world and a community of experts, and private and civic groups interested in sustainable solutions for today’s urban centers. Gosney is also traveling with a tour from the California Institute of Integral Studies (based in San Francisco, CIIS has its origin in common with Auroville). The Green Century Institute is a non-profit association and is a project of Inquiring Systems. Copyright © 2005 • All rights reserved.